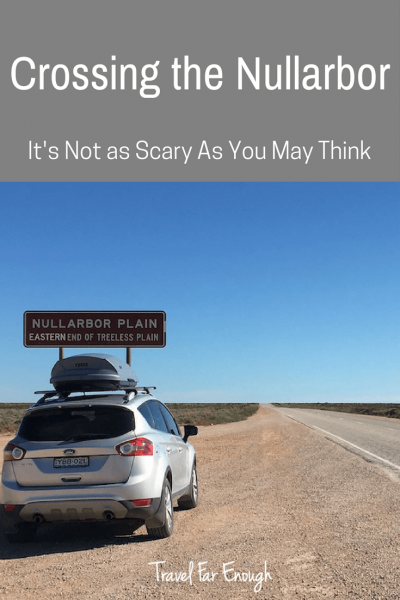 Before we began our trek across the Nullarbor, the great expanse of desert that connects South Australia to Western Australia, I had heart palpitations. I was beyond anxious. Driving the 1200 km between Ceduna and Norseman was the only part of our road trip I had worried about. I’d read so many stories over the years, prior to our own adventure, of people breaking down, being abandoned for days. Of people buying 4WDs, decked out with multiple spare tires and jerry cans filled with spare petrol and water, in preparation for this massive trip. Of people run off the road by road trains, left in the ditch, only to be pulled out, hours later, by another passing truck. I had this massively inflated image of being remote and the possibility of being abandoned for days. The reality was a long way from that image. In fact, we have felt more remote in other places. When we visited Finchley Track, part of Yengo National Park, which is an hour north of Sydney, we felt more isolated than we did standing on the cliffs of the Great Australian Bight. Standing on the viewing platform at Finchley Track, we saw no sign of civilization. No telegraph poles. No roads (it was a dirt track in and we heard no sounds of traffic at all). We saw no cellular towers. No people. It was quiet. Eerily quiet. I’ve never felt so isolated. Then and since. I expected to feel isolated on the Nullarbor. It couldn’t have been further from the truth. 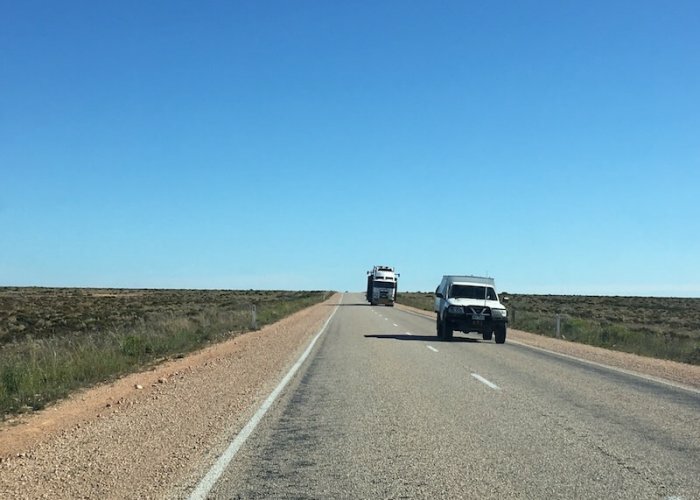 The Eyre Highway, which the Nullarbor is only a part of, is busy. 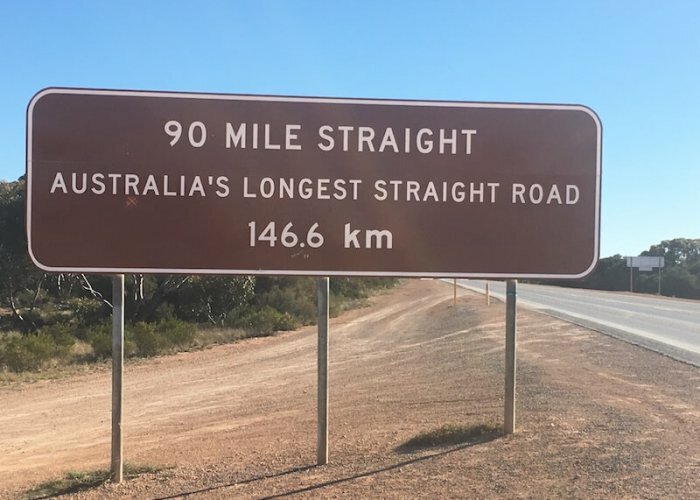 It’s the highway that connects one half of Australia to the other. There is constant traffic in fact. Road trains, which are semi-trailers carrying up to four trailers, zoom through in multiples. Baby boomers trudge along, pulling their caravans. 4WD enthusiasts, pulling their camper trailers or with their 4WD loaded up with camping gear, ready for the next off-road trek. Rental cars driven by overseas tourists, weaving their way along the highway, unsure of road rules and distracted by the scenery. It’s only at night that the Nullarbor is quiet, save for the occasional road train bustling through. You will still feel a sense of remoteness, because there’s not a lot out there. Roadhouses, the only places to get petrol and food along this stretch, are about 300 km (or 185 miles) or so between each one. It’s important – imperative – to plan before you hit this highway. You don’t want to be on the Eyre Highway at night. 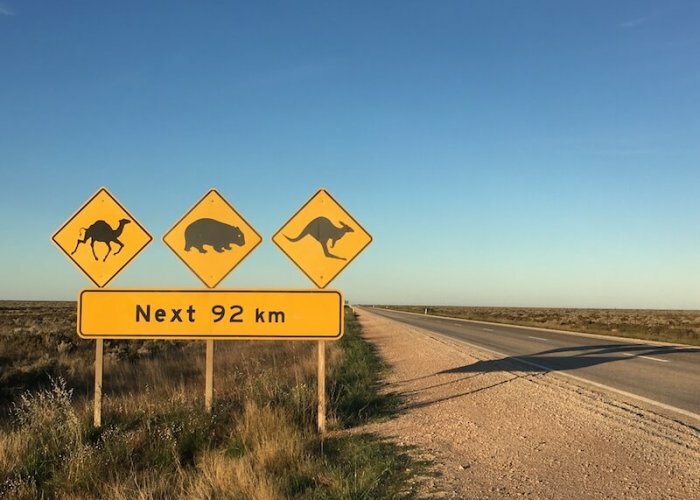 That’s when the wildlife come out to play and the Nullarbor does become a danger zone. Add in the road trains going at top speed to meet their delivery deadlines, it’s safer to be tucked up and out of the way. Despite the Eyre Highway being busy, you need to prepare to drive this massive distance. Before you head off into this great expanse, get your vehicle checked out. Book your car in for a service for an oil and filter change. Get your wiper blades replaced. Believe me, you’re going to need new wipers to get the bugs off the windscreen. Invest in some silicon spray for the front of your car. Spray it on the front area of your car and the backs of your side mirrors. Silicon spray won’t hurt your paintwork. If anything, it will protect it. Without the silicon spray protection, you’ll be scrubbing bugs from your car for months. What happens if we get a slow leak or the tire needs inflating and nitrogen is not available? We just fill it with air. We’ve been really happy with our decision to do this and it’s made a massive difference to our drive quality. Even our fuel economy has improved. Ideally, you want to take 4 days minimum to drive from Adelaide to Esperance, or 5 days to drive from Adelaide to Perth. Before you leave, map out where you intend to buy petrol. The distances are great and you need to have a fair idea before you leave. There’s not much out there, once you leave Ceduna. Know what type of fuel your vehicle needs and what petrol stations carry it. If you have a diesel engine, you’re golden. Diesel can be found at every station. If you’re vehicle takes premium petrol, know that not all petrol stations on the Nullarbor carry premium. That includes the massive roadhouses. Even if they do carry it, they may not have any in stock. Yes, we were told that nugget by one roadhouse, when we were afraid to be running on fumes getting to the next place. We were told that the roadhouse did not sell premium petrol. We had missed stopping for petrol at one of our below recommendations. Lesson learned. By the way – we made it with plenty of petrol in the tank. It was just another of my ‘nervous nelly’ moments. We recommend installing the Gas Buddy app and the Fuel Map Australia app before you head out. While not always updated with prices, it will give you an idea where you can get your type of fuel. Fill up in Adelaide (obviously). 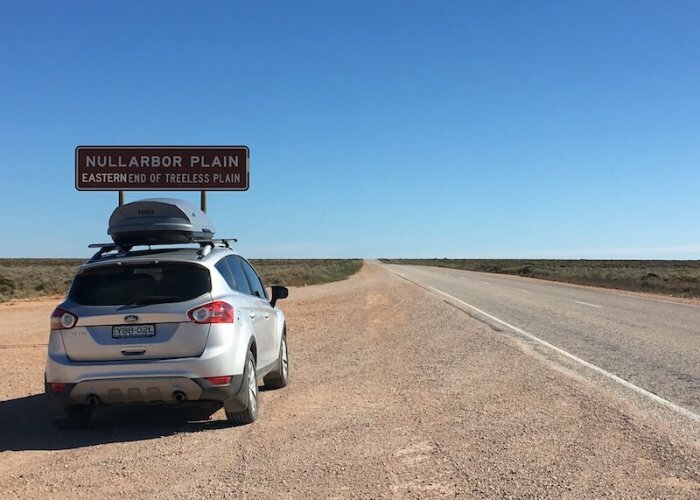 Then top up again in Port Augusta (it’s 307km to reach it), Port Lincoln (345km), Ceduna (403km), Eucla (493km), Cocklebiddy (273km), Norseman (437km) and Esperance (204km). Places in between charge a premium (up to 10-20 cents per litre more), especially the Roadhouses. Those we’ve mentioned have lower prices than most others. Because I was a ‘nervous nelly’, we topped up our tank at the Nullarbor Roadhouse which charged $AU1.90 per litre (or $US7.18 per gallon). The Nullarbor Roadhouse is between Ceduna and Eucla, yet Eucla reportedly is the cheapest petrol across the Nullarbor plain. Don’t stop at the border. They will gauge you (more than the Nullarbor Roadhouse) like there’s no tomorrow. Before you leave, map out where you intend to stay. Even if you are travelling with a campervan or caravan, map out where you intend to stay for the night. It’s easy to ‘push on’ and keep going when it’s still 5pm and light out. But driving these distances takes a toll on you and you don’t want to be on the highway at night. Don’t assume that you can rock up and check in to a roadhouse for the night, even in low season. As mentioned, this is a busy route, so places fill up. We called ahead for a reservation on the roadhouses we stayed in (we stayed in the motel section), and lucky for us that we did. They were full by the time we arrived, even the campground and it was only 4pm. There are many places for free camping along the way. We would have loved to do this, but we were driving our Ford Kuga and the weather didn’t comply for tent camping (although it is doable!). There are a lot of places to free camp along the way. WikiCamps is an amazing app resource to find camping spots along the way and there were times we wished we had a campervan vs. a car. We feel like we missed out on a part of the experience for our journey west and hope to rectify that by camping when we return east in the warmer months. For more information on what free camping is, check out our post about free camping in Australia here. Coffin Bay Lake House - Where we would have LIKED to have stayed! There were some destinations we loved along the way and would highly recommend no matter how you’re travelling. There are other places we wished we’d stayed rather than where we did. 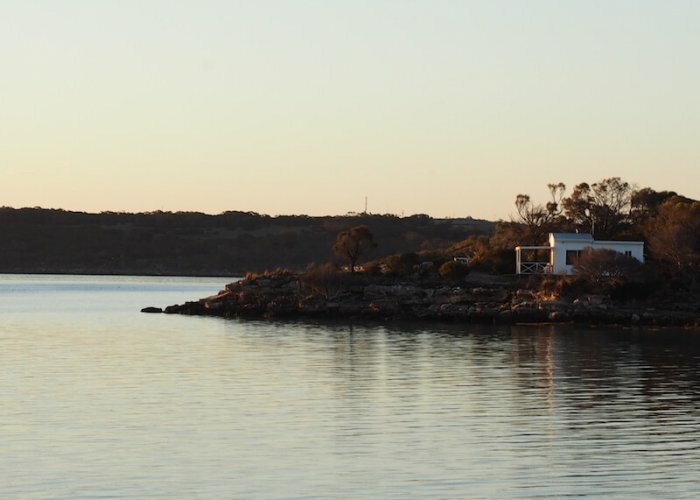 Skip Port Lincoln and head a further 44km to Coffin Bay. Despite the name, it’s a beautiful spot. The town was actually named after one of Matthew Flinders’ naval friends, rather than the conjured images of ghosts and ghouls hanging around the area. Coffin Bay is perfect stop. 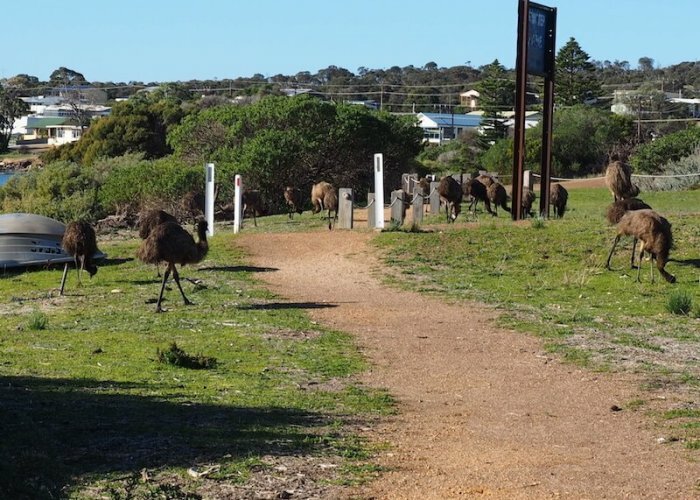 You can enjoy a long walk along the Oyster track, taking in the picturesque bay, the abundance of bird life, and even spot a flock of emus that hang around the town. There’s some great bushwalking in the nearby National Park and when you’re done, catch some amazing sunsets reflecting on the water. 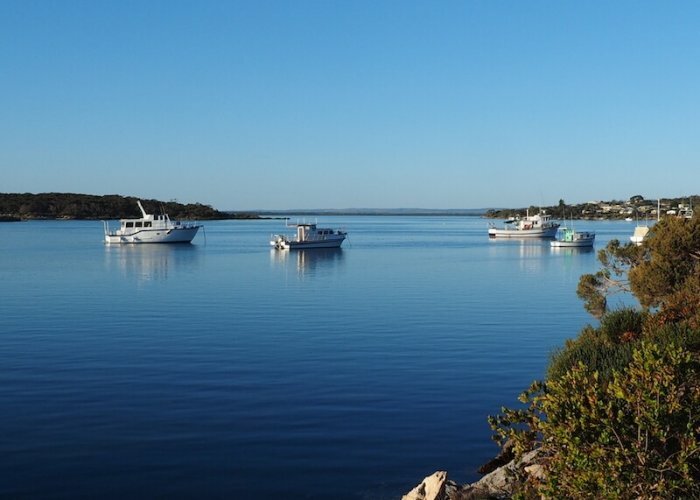 You can indulge in some fishing or relax and eat some of Coffin Bay’s famous oysters. Ceduna is a lovely town. It’s on the edge of the outback and it feels that way. Piped music through speakers playing in the main street, make visitors feel welcome. The Tourist Information Centre is one place to stop in for valuable info on the area. You’ll also get updates on the number of whales spotted (in season) at Fowlers Bay and Head of Bight before you head that way, which we found to be helpful. The Foodland in Ceduna is great. It’s large, clean and provides any basics you may need. 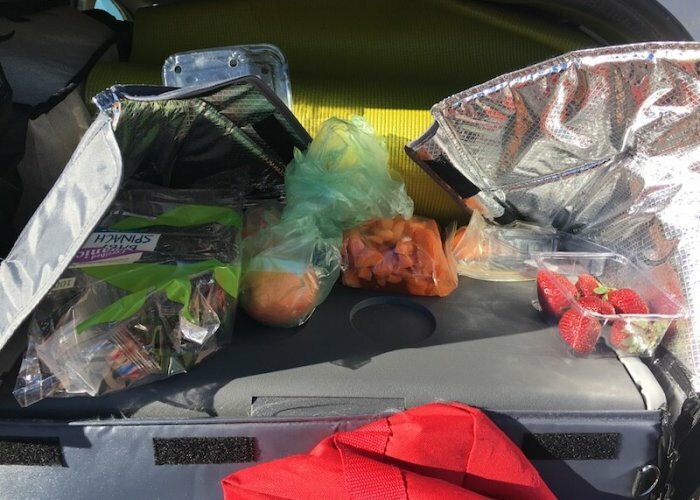 It’s only a 5-hour (give or take) drive to the Western Australian border and you cannot take any fresh fruits or vegetables across the border, nor can you take any honey (or honey products such as beeswax). Keep that in mind if heading westbound. There’s not much in the way of supermarkets before either Esperance or Kalgoolie, so stock up on what you may need for 2-3 days, depending on your planned journey. This is an experience in itself. While the roadhouse is not much but a large petrol station with a motel and caravan park attached, it’s in the middle of nowhere. It’s the first real roadhouse you’ll reach heading west and it’s just… iconic. There is a bar and a restaurant so you can have a beer (bottled, not on draft, which I found disappointing) before a good ol’ fashioned roast dinner in the restaurant. It’s pricey, I’ll warn you, but it’s worth it for the experience. There were some places we stayed that we weren’t as thrilled about. They are still worthy of a stop, but we wouldn’t recommend staying. I’m sure Streaky Bay is a lovely spot, especially in summer, but we got a weird vibe from this place. It may have had something to do with the fact that we were really hungry when we arrived at 2.30pm and couldn’t find anywhere that offered anything more than meat pies and stale sandwiches. Add in that our AirBnb ran out of gas for their hot water, without apology mind you, so we left for the Nullarbor after having sponge baths. It’s all part of the outback experience I suppose, but we paid good money to stay there, in anticipation of no showers for a day or two. Between the flies and the brown water staining the toilet (they truck in their water from Norseman, according to the roadhouse signs, yet Norseman interestingly had clear water in their toilets), there was a weird vibe here. The museum was fascinating though and worth a stop in for sure! Just don’t stay here. For the price they charge, it wasn’t worth it. Before you leave Adelaide, stock up on supplies. Make sure you have a few extra days supplies when you’re travelling the Eyre Highway. You never know if you may need it. There’s not much in the way of supermarkets outside of Port Augusta, Port Lincoln, Ceduna and Esperance. IGAs stock bare bones elsewhere, so we recommend buying supplies in Adelaide being heading off (the Central Market is great for stocking up!). You’ll know what you like, but we do recommend buying some basic sandwich supplies for when you stop and have a stretch. Buy fresh fruit, but do keep in mind the quarantine restrictions at the border. As they say: “Cook it. Eat It. Bin It.” You cannot take anything fresh across the border between South Australia and Western Australia and they will search your car. We spent the morning eating all kinds of things for breakfast, before we crossed the border: We had apples, carrots, cherry tomatoes, spinach, and a pear that we had to consume. It made for a lovely brekky. You want to be sure you have enough to drink on your journey as enough in case you do break down. I can’t stress this one enough. We bought a 6 pack of 2 litre bottles and stored them in the car. Another option is for larger containers, filled with water, but we found the 2l bottles were great for refilling our smaller water bottles we had up front in the car. We drank all 6 bottles by the time we got to Esperance and we took 4 days to drive across, refilling where we could with rain water along the way. This is a long stretch and it’s only once you reach the roadhouses that you will you have type of internet connection. So, load up your music, your audio books and your podcasts, before you hit the road. You’ll need them, believe me. Eat it or Bin It. Crossing the border. Yes, it’s isolated but you never really feel alone. Still, it’s a vast space and it takes a little getting used to. If you’ve lived in a city most of your life, you may even find it intimidating. But relax and breathe in the fresh air. Take photos of iconic signs along the way. Know that you’ll be okay because there are many people on the road and most will be happy to help should you have any issues. Breakdowns do happen. We saw a couple with a 4WD and a caravan broken down at the Nullarbor roadhouse at around 5pm. Their 4WD was being loaded on to a tow truck while their caravan was being connected to the back of the tow truck. It was a strange thing to see, especially with the caravan being connected. But, off they went, heading toward Ceduna, assumingly to the nearest service repair. If you do breakdown, there are many along the way who will help. Most people are pretty savvy out here. Most will stop and offer their help, or offer a ride to the nearest roadhouse. Use your judgement and trust your instincts. You may not have cell coverage, so it’s times like this you have to trust in the goodness of people. Keep in mind, most breakdowns are caused by either lack of petrol, flat tire or lack of water in the radiator. Best to check both all heading out each day. If it’s hot weather, take extra precautions. I’ve mentioned this a few times now. If you are driving a car, accommodations are limited and they are basic. You’ll pay a premium for a basic room. That is: a bed, clean sheets, a private bathroom and a television that may have a channel or two. Anything else is a bonus. Plan your route and make reservations early in the day, if not ahead of your journey once you know your itinerary. Pack as much water as you think you’ll need. Then double it. Water is scarce out here and if you do break down, you’ll need the water. Water also may not taste great along the way, if it’s drinkable at all, so pack your own. When people warn you not to drive in twilight hours and in the overnight hours, heed their warnings. The wildlife is not to be messed with here. Not only do you have kangaroos, but you have a big boys out here. If you hit one of these bad boys doing 110km/hour, you can say goodbye to your vehicle. Maybe your life. Add in wombats to the equation. They can be like hitting a low level cement wall and wipe out the front end of your car, and the undercarriage, if you manage to drive over it. There are feral camels out here too. About 1.2 million of them throughout Australia. I wouldn’t want to confront one in the middle of the road at night. Despite my anticipation of being a cash only journey, I was surprised to find that credit card options were widely availabile. We only found a few small shops along the way that were either cash only or preferred cash over card (and charged accordingly). Take some cash though, just in case broadband is down or the card machine isn’t working. Supply and demand. Those are the things to keep in mind out here. There’s not much supply and there’s a lot of demand, so expect to pay for it. Everything costs more including accommodation, petrol and food. Roadhouses, for basic rooms are around $AU140/night. Petrol is anywhere from $AU1.50/liter to $AU 1.90/Litre for premium petrol. It’s around $AU1.20 to $AU1.40/litre in metro areas around Australia at time of publication. A roast dinner at the roadhouse – I’m talking lamb or beef with 3 vegetables – is around $AU 27. A beer is anywhere from $AU8 – $AU 15 per bottle (not on draught). It’s no surprise, but there’s very little in the way of internet in the middle of the outback. Amazingly though, you’ll get 4-5 bars (IF you’re using Telstra), once you’re at the roadhouses! You’ll even know when you’re close to the roadhouses because you’ll suddenly see a cell tower in the middle of nowhere. When you arrive, you’ll see everyone glued to their phones for a while. It’s a funny sight actually. This is especially noted for anyone who is free camping. Charge your devices wherever you have an electrical outlet. Airbnb – for places to stay before and after you’ve crossed the Nullarbor. Click here for a credit for your first stay. We’d love to hear your tips and experiences, so leave a comment below! Great advice Jerry! Thanks for sharing your own experiences!